There isn’t much room in Michelle Horton’s tiny Baltimore row house. But there’s a lot of love. 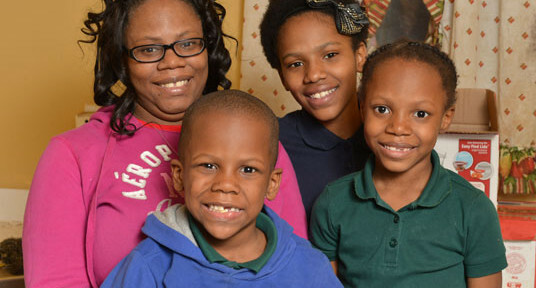 Michelle’s mother also lives there, so Michelle’s three children — Ayarna, Aniyah and Amori — have to share one bedroom. But there’s no fighting in that small room. “Whatever one of them has, they truly share it with the others,” Michelle says. Still, Michelle wishes she had more to give them. She’s been working at Hopkins for nine years, but she makes only $11.35 an hour as a nutrition aide. Her low pay makes the hospital’s health plan impossible to afford. As a result, Michelle and her three kids are on Medicaid. That’s the reality for many Hopkins caregivers. They work at America’s #1 hospital, but their healthcare is subsidized by America’s taxpayers. “Making it all work on $11.35 isn’t easy at all,” Michelle says. Recently, Michelle’s older daughter, Ayarna, had an opportunity to go on a school field trip. But it cost $20, money that Michelle simply didn’t have. Even though she also receives food stamps, Michelle had to spend all her money that week on groceries, and she had to tell Ayarna she couldn’t go on the field trip. “It was so hard to tell her that,” Michelle says. “I wanted her to be able to go, to have that experience, but there was no way I could afford it.